Mick Sloyan, the hugely popular winner of the 2018 David Black Award, attributed the notable successes he has been involved with over the past two decades to the ability of the pig industry to work together. Mr Sloyan retired as AHDB strategy director in the summer, after 40 years of working for the levy body in its various guises, including the last 20 working in pigs. In their citation, the award judges said Mr Sloyan ‘stood head and shoulders’ above a strong field as the ‘outstanding candidate’ for this year’s award. 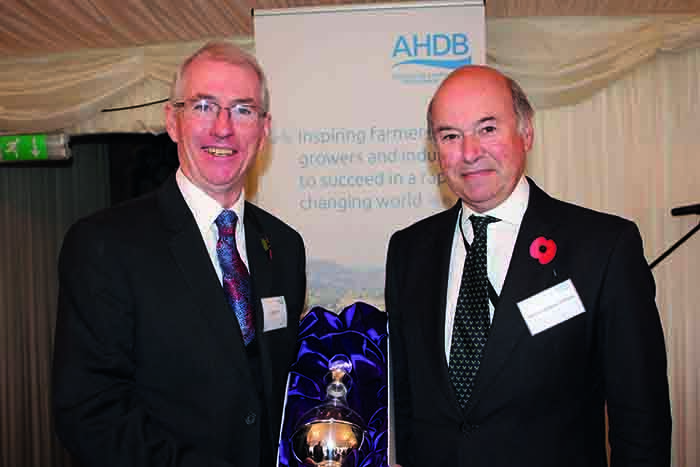 After receiving it from Defra Minister Lord Gardiner at the traditional breakfast ceremony at the House of Lords, Mr Sloyan said he was ‘deeply honoured and humbled’ to see his name added to the distinguished list of winners. “Over the years I have had the absolute honour of working with some fantastic people and I am tremendously proud of what we have achieved as a team,” he said. Listing his career highlights, he began with the introduction and maintenance of price reporting that earned the Meat and Livestock Commission’s market information service a ‘worldwide reputation’. He went to recall how he and others helped the industry through the BSE crisis with the provision of ‘solid fact-based analysis’ and how the industry then came together to respond to the 1998 pig price crash, the loss of exports and the 2000 classical swine fever and 2001 foot-and-mouth outbreaks. “We promoted the image of the British pig industry. Sometimes it was a little aggressive, but it was always done with passion,” he said. He cited the recent implementation of a ‘world class online pig traceability system for Defra’ and subsequent development of the eMB-Pigs antibiotic database, and his work with former BPEX chair Stewart Houston in opening up pork exports to China, an achievement singled out by Lord Gardiner. Mr Sloyan said: “We went from a standing start to over £70 million of pork exports last year – which is twice the value of Scottish whisky exports to China. “The one common theme in all of these achievements is that they only happened by working together across producers, levy boards, processors, the allied industries and government departments. “20 years ago, there was a vigorous debate about whether a pig levy board was actually needed. It is testament to the leadership of producers, processors and others that they decided to look beyond short-term difficulties. and invest their trust and money into the levy. This must continue as the industry faces the challenges ahead, including Brexit, the increasing public scrutiny on welfare standards, the impact of meat production on the environment and the health implications of eating meat, he added. “The industry must vigorously defend and promote its values. We have a very good story to tell. But only by working across the industry and Government will we get that message across,” he said. He concluded by thanking his wife of 37 years, Gill, for her unseen contribution to the industry, and his ‘friends and colleagues, who, let’s face it, did most of the hard work’. The independent award judges highlighted Mr Sloyan’s integrity, passion and humour. They described him as‘a calm and thoughtful provider of solutions’ and said his influence, guidance, encouragement and wise counsel have been evident at all critical points in the pig industry over many years. There was appreciation for his contribution from right across the pig sector, which the judges described as an ‘incredible achievement’. His contribution has always been valuable and has been sustained over a full and very varied professional career.